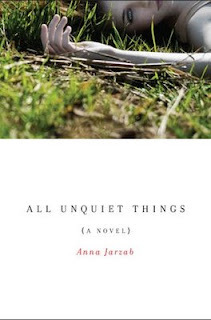 Today is the release day for All Unquiet Things by Anna Jarzab! Carly was impulsive, smart, and hurting. Both her boyfriend Neily and her cousin Audrey adored her, but neither of them knew how to get her the help she needed when her mother died, and neither of them did anything when Carly dumped Neily and began hanging out with the dangerous popular crowd. But both Audrey and Neily are shocked when Carly is found dead one night, murdered in cold blood, and a year later they are still struggling to deal with their guilt and confusion, despite the accused murderer, Audrey's father, being behind bars. But then Audrey approaches Neily, asking for help. The pieces of Carly's murder aren't adding up, and she doesn't believe her father is the killer. She suspects the murderer is someone at their school, who would go at any length to keep certain dark secrets covered. But in order for them to find the truth, Audrey and Neily will have to be honest with not only each other, but themselves as well, and risk ripping open old wounds and getting involved with dangerous people. Anna Jarzab's debut novel is a superbly written and immaculate mystery that is completely gripping and unsettling. Her writing style is smart and sophisticated, peppered with observations that will make you really stop and think. Her main characters, Neily and Audrey, are both very different but very authentic. Neily is smart and capable, but struggles to deal with an immense load of guilt. Audrey is a little more reckless and assertive, but deep down, she's searching for love and acceptance. The story flows perfectly as Jarzab carefully pulls back layer after layer of the events of over four years as the viewpoints switch back and forth between Neily and Audrey, and the past and present. The bulk of the story takes place in prosperous Empire Valley, and a lot of action plays out at Brighton Day School, where many of the students are privileged and unbelievably wealthy, but All Unquiet Things has so much more depth than your average rich teen novel. Instead, Jarzab exposes the dark side of rich living with unsupervised teens that have access to as much money, drugs, and alcohol as they want, and what happens when things quickly spiral out of control. The plot is twisting and complex, but it all comes together in a surprising, breathless end in such a flawless way, never once lacking in suspense. All Unquiet Things, simply put, had me under a spell. This is a complex, smart, and disquieting debut. Cover Comments: Unsettling. That's what comes to mind when I see this cover. It actually reminds me more of an adult novel than a YA in its simplicity and sophistication, but I think it will do very well among a teen audience as well. I love this cover (well, as much as you can love a cover with a dead body on it, anyway). ARC received from Random House. This one looks incredible ... and creepy! Thanks for the review. Sounds amazing! I can't wait to read it. creepy! Thanks for the review. I'm the YA buyer at an independent bookstore and read an advance copy of this a few months ago. Powerful stuff! And if you're not familiar with the TV series Twin Peaks you should check it out. Consciously or unconsciously they are very similar. I read this book because of your review. I am so glad I did! It was fantastic and anyone who loves a good mystery/romance should most definitely read it!